According to various news stories that we’ve blogged about in the last year you should worry about “germs” on your cellphone, doorknobs, toothbrush, dishwasher, houseplants, lemon slices, bouncy houses, laundry, etc. Not to mention avoiding handshakes… or really any contact with other living beings such as your dog or cat. So this got me thinking… what what your life be like in a scaremongering cleaning company nirvana where everything was sterile? Let’s assume you couldn’t get an ethics board to let you start with an unborn baby (which might not be sterile anyway). So let’s make a sterile adult. The first step is to remove all the bacteria from the inside and outside of your body. This is going to require massive doses of multiple antibiotics so expect to be really sick during this process. And hope you like diarrhea because without your gut microbes… you’ll probably have it for the rest of your (possibly short) life. The removal of all of your gut microbes is also going to dramatically affect what you’ll be able to eat. Most plant matter probably requires help from some of your gut microbes so you may be eating a whole lot of meat. Actually the jury is still out on that one… microbes may be required there as well. In fact it’s possible you’ll be able to eat very little at all and that an IV is going to be the best way to get nutrients into your body. So liquid in and liquid out. Normally if you remove all the microbes from your skin you’re going to make yourself much more susceptible to something like a fungal infection, but in this case we don’t have to worry about that since you won’t be exposing yourself to any new microbes. I’m guessing multiple showers in various germicidal substances will be required… probably over the course of many days to ensure you get them all. It goes without saying that you’re never going to contact a living being again (or breathe fresh air), so you’ll have to get one of those bubbles that they use for people with SCID (Severe Combined Immunodeficiency, a disease where your primary immune system doesn’t function). Not much room in the bubble so I’d give up on most forms of exercise or really recreation at all. But I’ll bet we can get you a wireless connection and a sterile laptop so you can blog about the experience. Although speaking of immune problems, it’s possible that when your immune system doesn’t have any real microbes to keep it occupied it will turn on your body… leading to a host of autoimmune disorders. This might include arthritis, multiple sclerosis, Celiac disease, diabetes, anemia, etc. We don’t know that this would happen, but based on our understanding of how some of these things develop it’s certainly a real possibility. Anything coming into the bubble will have to sterilized… some combination of UV, chemicals, and irradiation will probably do for most things. This will probably ruin some foods but hey… you won’t be able digest them anyway. Nutrition is going to be a major problem since bacteria synthesize a lot of essential vitamins in your body. Yah for the IV drip! So there it is. 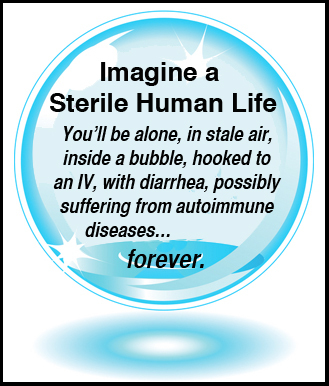 You’ll be alone, in stale air, inside a bubble, hooked to an IV, with diarrhea, possibly suffering from autoimmune diseases… forever. Which realistically probably won’t be that long. Or… you could leave a non-sterile normal happy life. Hi! Great post, i am planning for some time a collection of future present Microbiome Fables probably published on the net first.. Of course your sterile adult portrait gave me a good lead, would you mind if I would use this cautionar example? Feel free to use anything from this that you’d like. Just know that it’s a thought experiment and so not really based in data per se.